Immerse yourself in the alphabetical city of Alphabetical Sydney: Creative Lab at the Museum of Sydney this summer. Kids can explore the wonders of our beautiful city from A to Z. With 30,000 copies sold to date, Alphabetical Sydney has become a popular book amongst children and it's no surprise as the colourful illustrations and rhymes take you on a fun journey across Sydney. We were invited to the media preview of the exhibition today and were welcomed by the colourful world of author Hilary Bell and illustrator Antonia Pesenti. This fun interactive exhibition explores the alphabet in a creative lab highlighting the sights and sounds of Sydney. As you enter, visitors are invited to watch videos showing pages of the book, look at items that are mentioned throughout the book and with their Creative Lab booklet (given at reception), kids can investigate and fill in their booklet as they look through the exhibition space. B is for Bats - we loved making our little bat and hanging it in his cave under the stars and the glowing moon. The booklet includes a little bat to undo and glue together, a poetry factory piece of paper for visitors to add their little poetry pieces to the poetry factory. There is also a tag where children can fill in their name and where they dream of going to which they can add to the map of Sydney. They are also invited to fill in other details on the booklet while at the same time understanding where they are from, what are their dreams, what languages they speak, to draw their home, town and more. We love the way the exhibition is setup to invite little ones and their siblings to sit in the reading corner and enjoy a story or two. We also love the tables that have been setup for families to colour in together, fill in their booklet and enjoy the space. Little Miss loved drawing with her dad and filling in her booklet. A for Amusement Park is a great little spot where kids can dress up like a clown and look at themselves in the distorting mirror. Little Miss and her brother had fun playing dress ups and looking at their reflection in the mirror. P is for Paramatta Road. Listen to the sounds coming from Paramatta Road using the little headphones attached to the wall. Visitors can contribute their piece of poetry to the Poetry Factory board or play with words on the Word Play board. It’s almost the end of the exhibit when you see Z for Zoo - Taronga Zoo to be exact! Kids can make an origami paper boat and add it to the gorgeous Taronga Zoo backdrop overlooking the harbour waters. Don’t miss W for Mr Whippy on your way out, press the ice cream truck button to hear the sound of delicious ice cream! Cute photo opportunities throughout the exhibition and next too the exhibition’s favorite symbol - the Sydney Ferry at the exhibition's entrance - selfies the ready! 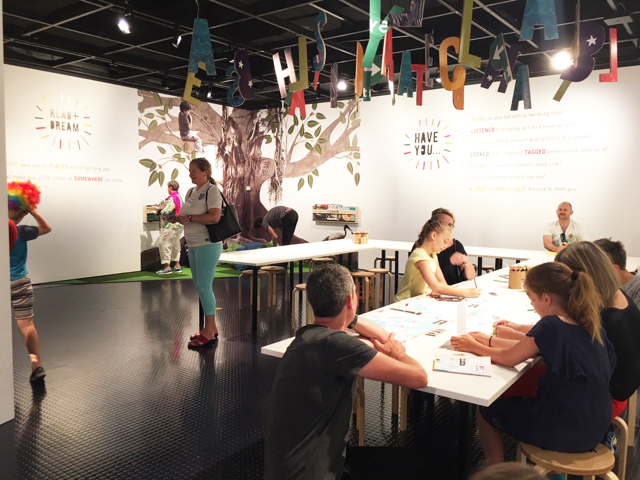 We loved Alphabetically Sydney: Creative Lab at the Museum of Sydney and we can’t wait to visit the exhibition again this summer. On now until Sunday 12th of August 2018. For more information on Alphabetical Sydney: Creative Lab and the Museum of Sydney or to book, head to their website. To celebrate the opening of Alphabetically Sydney: Creative Lab at the Museum of Sydney, we have 3 family passes to giveaway each valued at $30!! To enter, head to our Instagram page, follow us, like our Mr Whippy post and tag a friend (we will check both). Each tag represents an entry, the more entries the more chances to win! Good luck - entries close Tuesday 5th of December at 5pm AEST. Entries open to NSW and VIC residents only.